How to Become a Live Roulette Dealer – Live casino games have become incredibly popular over the last few years, and more players than ever before are beginning to take advantage of the technology, as it allows them to get a land-based casino experience from the comfort of their homes. A live casino is now offered at almost all reputable online casinos, and games can include Roulette, Blackjack, Sic Bo, 3-Card Poker, Baccarat, and Casino Hold ‘em. In this post, we’re going to take a look at live Roulette – and how you can become a live Roulette dealer. We will also take a look at some of the pros and cons associated with becoming a live dealer, and we’ll begin by looking at what live Roulette actually is. What is a Live Roulette Dealer? Generally, the only things a live Roulette dealer needs to do is communicate with the players (ensuring the game is a positive and enjoyable environment), along with spinning the Roulette wheel. The results of the game (including the payouts) are all handled automatically by computerised systems. Live Roulette is usually set in a land-based studio which is set up especially for live dealer games. This is, generally, a three-room setup, and it will include a live studio, a server/software room, and an analyst’s room. Some of these studios will have multiple games in one room (i.e. multiple Roulette tables), while others will have dedicated rooms/areas per game or table. What is the Difference Between Working in a Land-Based Casino and a Live Studio Casino? The main difference between the two, is undoubtedly the fact that there is no face-to-face interaction. While, as a live casino dealer, you will have contact with players, it’s a lot more relaxed, as you don’t have players physically at the table placing bets, drinking, and asking questions. Naturally, the atmosphere of a land-based casino is energetic. Players are often visiting the casino with friends, to have a good time – and they can be loud. Dealing in a live dealer casino, this isn’t the case, although you will take on a different set of responsibilities, as we’ll look at below. What Responsibilities Does a Live Roulette Dealer Have? As a live Roulette dealer, you’ll need to be able to present yourself in a diligent, respectful, and professional manner. You’ll be interacting with a host of different types of players, all of whom reside in different countries. This means, of course, that you must be respectful, and sensitive to different cultures and traditions. To become a successful live Roulette dealer, you’ll need to be able to display a positive attitude (even when you’re not necessarily feeling your best), and you must have a good understanding of the game’s rules. After each spin, you will need to be vocal about the result. You will also need to be able to interact with players, both to ensure the game remains a positive environment, and also to answer their questions and provide help and guidance, where appropriate. When it comes to becoming a live Roulette dealer, there are a couple of options available to you. The first, and the most common, is to find a live casino games tuition centre*. They will provide all of the training you need, and will be able to provide you with links to potential employers – making them a preferred method of entering the industry. Of course, these courses cost money, and the price ranges from between €500 and €1,500. In many cases, it may be possible to receive funding from a potential employer, or you may also qualify for a tax deductible refund, depending on where you take the course. The courses also range in length and complexity, depending on a number of factors. Some trainees prefer to be trained just in Roulette, whereas others will want to gain training for multiple variations of table games. This is entirely up to you, although it’s worth pointing out that the more games you’re able to deal, the more chance of finding employment you will have. During the training, you’ll learn everything from the ins-and-outs of the game’s rules, to proper camera etiquette and more. In short, after the training, you’ll be fully-trained to actually be a live Roulette dealer, and you’ll be prepared for potential employment after! Now, the second way of entering the industry, is to get a sponsor, or to train directly with a live casino studio. This appears to be a much less-common method of entering the industry, and it will likely only be offered to those who already have experience/contacts. Still, you may well find an employer who is willing to cover the costs of your training. This will, however, vary tremendously from country to country. *Read more in our “heads-up” below. While the specific training offered will vary depending on the course provider you choose to study with, generally, you’ll work on a few core areas. The first, is the actual dealing of the game. This will require you to learn how the games actually work, learn the different types of bet available to players, and it will also prepare you for taking bets. While this won’t actually be used in a live casino environment, it’s still taught, as it’s important that a croupier understands the game they’re dealing. The next area you’ll be taught, is special training in body language and facial expressions. This is because, for most of your time at work, you’ll be on a camera in front of players. You will be taught how to announce the results of the game, and how to announce winning numbers. The third core area of training, will be communicating with customers. You’ll be trained in everything from maintaining conversations, to learning to recognise the signs of problem gambling. In short, you’ll learn everything you need to be able to run a live Roulette game on your own – and you’ll be taught all of the skills and procedures you need to be a success! There are a number of benefits to becoming a live Roulette dealer, and while not everyone will find the career suitable for their personal circumstances, for those wanting to enter the casino industry, there are a number of ‘pros’. One of the biggest benefits, is that – unlike croupiers in land-based casino outfits – there isn’t any math knowledge required. 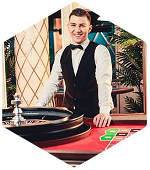 Croupiers working on a Roulette table in a land-based venue need incredibly astute math skills; they need to be able to calculate payouts for bets on the spot – and this is all in conjunction with ensuring players are placing the correct bets, and spinning the wheel. Being a live Roulette dealer online, you don’t need to worry about any of this. In fact, pretty much all you need to do is interact a bit with the players, and spin the wheel. All of the payouts are calculated automatically using computerised technology, so there’s nothing to worry about in that regard. Another benefit of being a live Roulette dealer – something we’ve already looked at – is that training is relatively straightforward, and fast. Many training programs take as little as a week – and this means you can complete training, and begin earning a LOT quicker than you would were you dealing in a land-based casino. Of course, as with anything in life, there are cons associated with being a live Roulette dealer. One of the biggest downsides is arguably the low starting pay. Another downside of live dealing is the location factor. At the time of writing, the vast majority of live dealer casinos operate in eastern Europe – so this may prove problematic to those residing elsewhere who prefer not to locate. Still, despite the negatives, becoming a live Roulette dealer has many benefits – and as you’ve seen from this post, it can be a lot easier to get into than you probably think. So, You Want to be a Live Roulette Dealer. What Next? The first thing you need to do is decide if you’re fully committed. If you are, then it’s time to start looking at various training programs and courses you can take. The cost of such courses will vary depending on where you take them, and the actual context of the course – but at the very least, you’ll want to make sure you come away from the course with some sort of qualification that’s recognised by potential employers. Once you’re qualified, it’s simply a case of looking for job opportunities as you would when applying to any job. Becoming a live Roulette dealer isn’t the easiest thing in the world – but, if you’re committed, passionate, and driven, you can quickly find yourself working in a live casino studio, and the rewards can be fantastic.